Salvation And Survival: Ebola UPDATE: This Is Getting Serious! Ebola UPDATE: This Is Getting Serious! That being said, I don't have to tell you what this could mean if any subsequent members of the Brantly family develop the disease. This could potentially become a domestic national emergency scenario. If there is a case of Ebola in Abilene, TX, what are the chances that it spreads? Could an entire city be put under quarantine? What is the likelihood that martial law is enacted to "protect the populace"? Secondly, I want to introduce you to TEKMIRA, a pharmaceutical company that is a self-proclaimed world leader in RNA interference (RNAi) delivery technology via nanotechnology. INTERPRETATION: genetic manipulation using nanotechnology. Why am I telling you this? Would it raise any suspicions on your part to know that TEKMIRA just received a $1.5 million cash contribution from Monsanto? Or that one of their partners is Bristol-Meyers Squibb? Or that this same pharmaceutical company also received a $140 million contract from the Department of Defense, and was granted a Fast Track designation from the U.S. Food and Drug Administration for the development of it's vaccine, TKM-Ebola? Is this all coincidental, or do they know something we don't? Wherever Monsanto is involved, you can bet that there is some underlying benefit to their bottom line. In this case, the Wall Street Journal speculates that should an Ebola epidemic become reality, this deal could be worth over $86 billion for an effective Ebola drug. And I'm sorry, but are we taking all the necessary precautions to stop this horrible disease from becoming rampant in our country? OK, we've quarantined a family in Texas, but what about the President going forward with a summit meeting in Africa this next week? It seems to me that the continent of Africa is on the verge of panic, closing down borders and airline travel, yet we are going to endanger our government officials, and then possibly bring the disease back to our shores? The subject of the vulnerability at our southern border should be obvious to everyone, yet I don't see precautions being taken. How is it moral or ethical to maintain an "open borders" policy, when the world is experiencing a global Ebola outbreak? The fact that the Department of Defense has dispensed Ebola Detection Kits to National Guard teams throughout all 50 states, doesn't really give me much comfort. Detection kits won't stop the spread; they will just identify the current case. I want some real prevention! Then, just in case you haven't seen this bit of news as reported by The Daily Mail, here is something you might want to pay attention to: "Nigerian health officials are in the process of trying to trace 30,000 people, believed to be at risk of contracting the highly-infectious virus, following the death of American Patrick Sawyer in Lagos." Just how in the world is that going to be accomplished? And if this scenario isn't enough to scare you, consider this fact from the Public Health Agency of Canada: "It takes just ONE aerosolized organism (a microscopic virus riding on a dust particle) to cause a full-blown infection in humans. This is why one man vomiting on an international flight can infect dozens or hundreds of other people all at once." And now there is a potential for 30,000 people to be infected? Multiply 30,000 by 12 or 100 and you can see where I'm going with this! The purpose of this post is not to unnecessarily scare you, but to inform you. I believe that the MSM is down-playing this too much, and the government is not being forthcoming with their information or plans. So I want you to know where it stands today, and to take as many precautions as you can ... and I would put prayer at the top of that list. 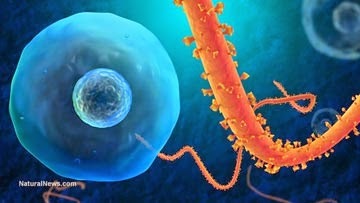 Revelation 18:4 Then I heard another voice from heaven saying, “Come out of her, my people, lest you take part in her sins, lest you share in her plagues;"
I have to admit, I've run this scenario through my mind after hearing a doctor report that this E-bola outbreak started in an unnatural way. He stated it started out in a major African city, instead of the jungle, as the others did. Almost as if it were put there... Now, couple that with what you discovered, Hmm. I just wonder when all this funding started with Monsanto and the pharma company you mentioned? Before the outbreak, perhaps? As usual, when there is a solution, there must first be a problem. A global pandemic would Satans dream. His NWO, via the UN, would have the worlds population in their total control. Humans would give their last possession, and most would probably beg, or gladly take the "mark" to save loved ones. This would be the perfect scenario! Satan would appear to be a redeemer, saving mankind, or the remnants of, while taking total control of the world, in a peaceful fashion, without ever firing a shot. It would also achieve the goal of Agenda 21, to depopulate the earth by 80%, which is by coincidence, the average mortality rate of E-bola. They could effectively vaccinate their army first while letting the disease spread, thus eliminating the need to disarm our population. Wow! What a diabolical plan! It even fits Gods warning of pestilences. Maybe the "border crisis" is just a false flag, to divert our attention, while the disease spreads or, maybe it is a tool to spread the disease here. These children have to be rounded up in their own countries first, I mean, all these children just didn't get the idea at the same time to suddenly come here....They could easily be infected there, before they are flown here by our gov't. Our gov't could say they are going to "vaccinate" these children, before bringing them here, to prevent these diseases they already have, from infecting our population. Our compassionate citizens would be more inclined to accept these poor children into their homes. A Trojan Horse indeed. As you said, Pray! Just an update, I researched Tekmira. Apparently their contract with DOD started in 2010. In May 8, 2013, at the TIDES Summit, Tekmira revealed it had successfully completed the TKM-Ebola vaccine. DOD completed its 140 million dollar payment in Oct, 2013. This has been in the works well before this "outbreak". So, it appears they did indeed, create a solution, before there was a problem...Now we have the problem, how convenient. Is it surprising that the gov't was soliciting venders to accompany children to the US back in the beginning of this year? How much of this is real and how much is HYPE?? HIV supposedly started from monkeys in Africa who escaped their cages! Yes, there WILL be pandemics, plagues and pestilences. That's a given. How do we know which is real and which is a "false flag"? How many times has the PTB cried wolf and the sheeple follow in lockstep to get their toxin laden shots? In everything....EVERYTHING.....God warns His own to have discernment. God warned us in His word what is already here with more to come for those with "eyes to see and ears to hear." And we ain't seen nothing yet! EVERYTHING...everything... DONE IN America IS ALL ABOUT MONEY. Follow the money trail and its easy to see the crime. There is no conscience of human safety or care in any "agency" or govt entity. And there is ALWAYS the distraction that covers over the real and far worse issue of the day - the wizard and deceit behind the curtain. In this day and age we are in there is great deception. God already told us there would be plagues, pestilence...no different than in the days of the Exodus from Egypt. Only much worse. How much is HYPE and how much is fact? Our govt controlled media, WHO (World Health Organization, CDC, Bill Gates, drug companies are all...ALL...in bed with politicians, alphabet agencies like FDA, USDA and vice versa. ALL motives are about population control, killing the masses, conditioning the public and mind control, and spreading as much HYPE as possible to control the sheeple, the sleepy masses and in a great rush to get people vaccinated with cancer, etc. causing toxins. Look up any MSDS Material Safety Data Sheets (required by law for any chemical) from any drug company and see the contraindication, warnings. Too often the vaccine is worse than the plague" as the population control crowd panders to the drug companie$$$$$$$$$. Discernment is greatly lacking in America. And, especially, for most Christians that are still in a satanic induced stupor. God's word says "Be alert." Be awake", Yes, to even deceive the very elect, if that is possible...so it must be possible to deceive. I don't believe in jumping on every chaotic and hyped bandwagon. Sooner or later everything is revealed. When the H1N1 flu hit the scene the drug companies, MSM and govt shills, CDC, WHO were telling pregnant women, the elderly and infants to get their flu shot. I know more people who have gotten very sick from those flu shots and still got the flu! Checking out the MSDS, easily and readily available on line from each of the 4 drug companies that manufactured the H1N1 flu vaccine, it contained a mercury derivative, AND it was NEVER tested on pregnant women or infants. After the HYPE and H1N1 faded away, it was discovered that hundreds, perhaps thousands, of babies were given expired vaccines. Well, of course, the drug companies had millions of dollars invested in these drugs. they were not going to let all that $$$ go down the drain were they?? Stockholders had to be appeased, didn't they? I remember the days when doctors would not even allow aspirin to be taken by pregnant women!! Now we are encouraging toxic vaccines. Why are so many babies being born with serious birth defects? There is a pandemic today of infants and young children having epilepsy. Why is that not researched? Why does the public never hear of that? There is a pandemic of cancers. There ARE cures for cancer, but then the drug companies, medical device manufacturers, and doctors (AKA legal drug pushers), would lose billions of dollars..
Hosea 4:6 "My people are destroyed for lack of knowledge." That includes knowledge of Who He is and also keeping our eyes open for what is currently going on here and around the world. AND HAVING DISCERNMENT. We must never take our eyes off the Shepherd and Guardian of our souls. Update, Tekmira entered contract with DOD in 2010. The "vaccine" was 100% effective as per announcement at the TIDE summit, May9 2013. DOD completed payment of 140 Mil to Tekmira, Oct 2013. Suspicions confirmed. I don't even know where to go with all the comments here but I will say that any vaccination is based on the current virus and not the replication of the following year when the vaccine is available, thus the reason most people get the flu after a shot. By Oct of each year when the vaccine is available, the virus has already replicated because it reproduces fastest in the earlier parts of the year and Oct is already too late for that last flu strain that it is fighting. Any virus is at a constant state of replication. That is why we have created an entire complex of superbugs that can not be treated by any medication. I have no doubt that DoD has worked with pharmaceutical companies to develop drugs for pandemics we think we are isolated from and continue to even weaponize some of these viruses. Suddenly FEMA camps and martial law seems very real. The Georgia guide stones, underground cities filled with everything to restart life, CEO's and elites that are retiring and disappearing. Governmental agencies stockpiling ammo. The list goes on and on. Let us as cognitive, thinking organisms ignore the reality before us. For many of us it's over. Personally I think we should probably be more concerned about what's coming across our southern border. We are already hearing about diseases most Americans have not encountered or we haven't had to deal with in a long time. What about those who are passing through not being caught? And am I the only one who doesn't trust the government or the media to tell us everything that people are carrying across? This is criminal what Obama is doing. Putting all of us in danger with open borders. How stupid. Usually the "disease" is created by Big Pharma so they can then create the "crisis" that goes along with their created "Disease". America has lots of blood on her hands including false flags, created "diseases" so they can create their "designer" drugs that create more side effect "diseases" ...and the beat goes on and on. Anyone ever notice that the Viagra men get younger and younger??? Sad, very sad. Excellent post with excellent points. Thank you.